Am I Minister Material? -- A Ten Year Anniversary. Ten years ago, on Christmas Eve, I shared in one last service of worship at First Christian Church of Santa Barbara. Although I had been ordained for more more than a decade when I went there, it was my first full time pastorate. I went there after a brief attempt at teaching theology at a Christian College that was more conservative than I was. After five and a half years, my attempt to be a pastor was coming to an end. Two positions, one in academics and one in church ministry seemed to come to an end in failure. I began to wonder what I was called to be and do. On that evening ten years ago tonight, as I shared in worship one last time, I wasn't sure about the future. I had been told by one church member that I wasn't minister material and should go see a career counselor. I never did that, but I did wonder whether this person was correct about me. Ten years later, I'm well into my sixth year at my current congregation. I now believe that I am both gifted and called to this ministry, but it took time and a great deal of spiritual healing to get to the point where I believed this might be true. I have to admit that for the entirety of my ministry at FCCSB, I did hold out hope that I would end up back in the academic world. That was why I had taken the time to earn a Ph.D.. and write academic books and articles. I didn't need to do either to be a pastor. Ten years later I've still not returned to the academic world on a full time basis. I keep my toe in the pool, but just a toe. But for more than a year following my exit from FCC I wrestled with the question about whether or not the pastorate was where I needed to be. After six months of looking for something, I was hired on a half-time by the local affiliate of the Anti-Defamation League as Project Coordinator for their "No Place for Hate" campaign. In essence I became a community organizer. At the same time I started this position, my Regional Minister, the late Don Shelton, asked me to serve as the half-time interim pastor at First Christian Church of Lompoc. For the next year, as I served these two different employers I asked the question -- who am I and what direction should I take. I was very attracted to the idea of being an interfaith activist (if only someone would hire me full-time). I wasn't at all sure about being a pastor. As you can see, in the end I chose to follow the call into the pastorate. I have to thank the good people at FCC Lompoc for providing me a place to heal and discern my call. Although I would ultimately choose to leave the safety of that congregation for a new place of ministry, it was my time in Lompoc that helped me see my future more clearly. I think I may have truly become a pastor during that time, or at least I was able to let go of the "dream" to return to the academic world. Instead, as Paul writes in Philippians 4:11, "I have learned how to be content in any circumstance." I now am content in my calling to serve here in Michigan -- a place I never expected to land. And, interestingly enough, with my call here I became engaged in the work of community organizing. What I have learned these past ten years, is that God's grace is sufficient. I have learned that finding one's "place" can take time (and maturity perhaps). I decided to write about this anniversary because it has been on my mind of late. And as the prophet Habakkuk puts it: "I will rejoice in the Lord; I will exult in the God of my salvation." Why? Because "God, the Lord is my strength; he makes my feet like the feet of a deer, and makes me tread upon the heights. " (Habakkuk 3:18-19). By the way, these two texts are foundational to my homily this evening. Happy Anniversary -- and a Merry and blessed Christmas! 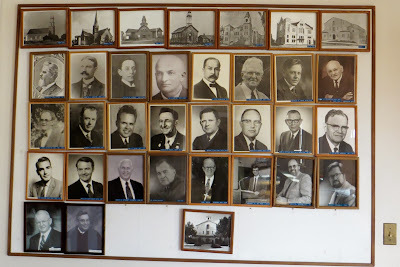 Note on the picture: This rogue's gallery contains pictures of most of the pastors at FCCSB. (Some are interims). For some reason the current pastor is not included, If Elaine were pictured the "maleness" of the lineup would be broken up just a little. You will find my picture at the end on the right of the second to last row). That was taken fifteen years ago, so I was a bit younger. If you go to the first row of pastors, the second person on the left is Burris Jenkins. He was run out of FCC, but ended up as founding pastor of Community Christian Church in Kansas City. I'll leave any comparisons to the beholder!